There are few things as relaxing as a sunny summer day spent on a boat – whether that is a ski boat, a fishing boat, a canoe or a rowboat. However, before you cast off from the dock, there are some things you should do to make sure that you are safe on the water. Take a safe boating course. Many organizations offer safety courses that can help prepare you for just about anything that might happen while you are boating. Check for courses in your area, and sign up. As an added bonus, you might get a discount on your boat insurance if you complete the course. Check your boat’s safety equipment before you head out. For example, if you have a power boat, make sure that your horn and lights are working and that you have a working fire extinguisher on board. Have an emergency kit, including first aid supplies, water, blankets and a flashlight, especially if you are going to be far from land. Have a fully charged cell phone with you. If you think you will be outside cell coverage, have a working marine radio -- and know how to use it. Have enough life jackets for everyone on board, and be sure that the life jackets are an appropriate size. For example, young children should have life jackets that will stay on without riding up and covering their face. Wear life jackets. Everyone in the boat should wear a life jacket; it isn’t enough just to have them in the boat. If disaster strikes, you might not be able to get stowed life jackets out and put them on – and the result could be fatal. If you are thrown from the boat and knocked unconscious, for example, a life jacket will keep your face out of the water and help keep you from drowning. Don’t overload your boat. Your boat should have a weight or passenger limit. If you have too much weight in your boat, you could be swamped. Check your engine and electrical system if you have a power boat. Make sure everything is working properly before you leave the marina. Don’t drink and boat. 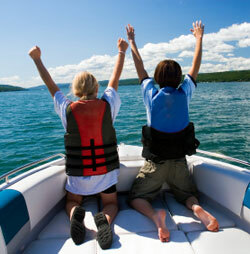 Alcohol is a major contributor to boating accidents, especially fatal accidents. And penalties for boating while under the influence can be as severe as those for driving under the influence. Drive carefully. Keep your speed under control, and be aware of possible underwater dangers such as stumps and reefs. If you are boating in an area that has navigational buoys or similar ways of showing where safe channels are, understand and follow those buoys. Observe no-wake areas, and don’t get too close to the shore, swimmers or other boaters. Check the weather before you go. Stay off the water if the forecast calls for storms. Leave a plan with people on land. Let someone who is not going with you know what time you are leaving, where you are going and when you expect to return. Then if you don’t show up on time, that person can alert the authorities.